Privacy fears surrounding the original body scanners never made it to court, but the TSA is now spending over $44 million to roll out the new units out to 29 US airports, starting with Boston. The TSA is dressing up security at Logan International Airport. The Transportation Security Administration hopes to allay privacy concerns about passenger screening in Boston by rolling out a new type of body scanner. The 27 “millimeter-wave” scanners being installed come with software that replaces “passenger-specific images” — or nearly naked views of travelers — with generic outlines that highlight only anomalies such as belts, jewelry, wallets — or guns or bombs. The new scanners are supposedly as fast as walk-through metal detectors. Photo by David Prasad. 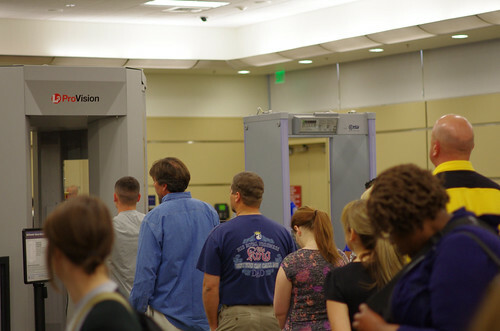 Passengers who opt out of passing through the new scanners must go through a metal detector and undergo a pat-down search. Manufactured by L-3, the millimeter-wave scanners cost $140,000 each and work by bouncing electromagnetic waves off a passenger to detect anomalies. They will replace 17 low-energy X-ray, or “backscatter,” machines that were deployed at Logan in March 2010. For privacy reasons, the machines required a separate room staffed by a TSA officer, who would radio any anomalies to another officer, who in turn would search the passenger. Mari J. Frank, a California-based privacy attorney, said the effectiveness of the millimater-wave scanners to detect explosives remains to be seen, but they offer the advantage of allowing passengers to see the same image the officer sees. “If it’s transparent and there’s no radiation, it sounds like an improvement,” Frank said. So far, five of the new units have been installed in Terminal A at Logan Airport, and four have been installed in Terminal C. In all, there are about 175 backscatter machines and about 555 millimeter-wave units at airports nationwide. (c)2012 the Boston Herald. Distributed by MCT Information Services.